I joined JD a few months ago on the PPC Show podcast to talk about my experience using Facebook’s campaign budget optimization feature which was (at the time) just starting to be released to advertisers. After spending over $400,000 on campaigns with Facebook’s campaign budget optimization enabled in the last few months, I believe it is one of the ad platform’s most impactful changes ever, allowing advertisers to truly scale their campaigns with ease. While Facebook still has this release in beta (as of the publish date of this article), it has proven to work very well across a wide range of audiences and industries. This guide will cover insights gained while working with this functionality on large-scale campaigns using the lead generation and conversion campaign objectives. Facebook’s launch of the campaign budget optimization provides direct response marketers an automated way to leverage Facebook’s predictive bidding to scale their conversion volume across multiple ad sets. Balancing budgets to maximize ROI is one of the most important tasks a paid media manager can focus on — and with Facebook now handling this aspect of campaigns, it frees advertisers to focus on more strategic campaign components like ad content, targeting and landing pages. What does Facebook Campaign Budget Optimization do? How do I activate Campaign Budget Optimization? Using campaign budget optimization is easy and can be activated on the campaign settings for any new campaign. It can not be applied to existing campaigns that were running before this option was enabled for the account. Simply click on the toggle option to optimize budget across ad sets when initially setting up your campaign and create your ad sets as you normally would. Who should use Campaign Budget Optimization? The core functionality of campaign budget optimization is built for advertisers who are looking to scale their program performance. Advertisers with hypotheses about specific audiences can now use Facebook’s predictive bidding to see which will result in more conversions. With this in mind, it is perfect for advertisers who are looking to test and find new ways to expand their campaign reach while also maintaining performance. Are there limitations for advertisers? Because Facebook will be automating some aspects of your campaign, there will be some platform limitations in place (at least for the beta) that you should be aware of. You are unable to daypart, use accelerated delivery or make changes to bid strategy once a campaign is published. Additionally, you cannot use import and export functionality with Power Editor to build campaigns from a template. While these aren’t deal breakers by any means, these limitations may hinder the use of other more advanced strategies. When should I not use CBO? There are a few situations when using campaign budget optimization is not recommended, primarily for short-term campaigns of less than a week or campaigns with only one target audience. Because Facebook’s bidding engine needs time to “ramp up” and collect data while using CBO to really be effective (just like standard campaigns), it’s best to make sure there is ample time to build a conversion history that can ultimately improve campaign performance. Further, if you have audiences and campaigns that have historically performed very well for you, keeping those in a standard campaign can be a very smart move, as you will have the ability to optimize those audiences independently of separate CBO-enabled campaigns. One of the most important things to understand when working with this functionality is that it will change how you structure your entire account. With budgets being managed only at the campaign level with contained audiences now going “head-to-head,” there are a number of considerations in how and when to use CBO most effectively. 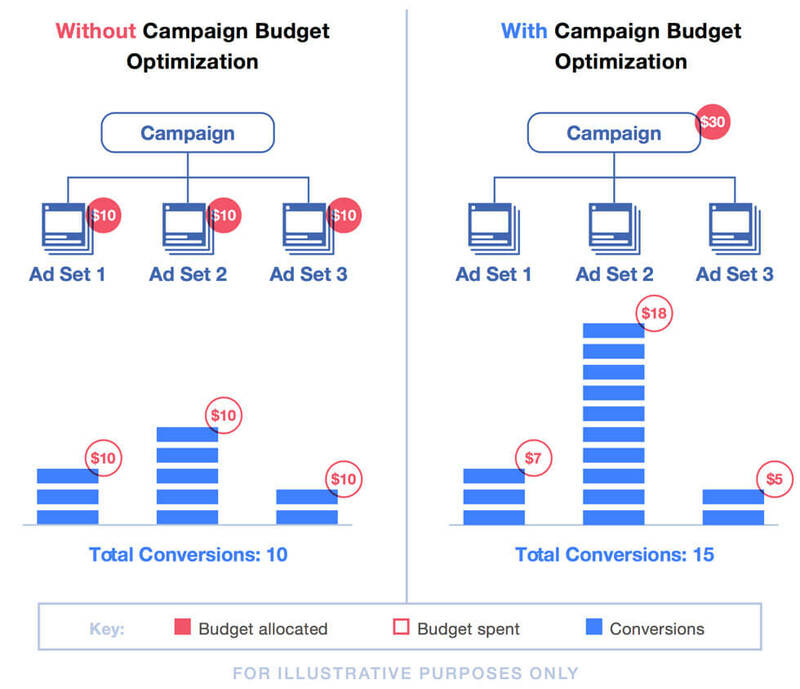 After running across multiple Facebook Ads Objectives, it is clear that campaign budget optimization was made for performance marketers. While I have not tested CBO extensively with engagement-based campaigns, I can say that when testing with Reach and Awareness objective campaigns, the budget was not always allocated toward the top performer of the campaigns’ primary metric (CPM and Reach CPM). You likely already have different types of audiences and offers that are converting well across your account in multiple areas of the funnel. In a standard campaign, grouping these together in different ad sets is not a problem because each ad set functions independently of the others. But with CBO, this is not the case. When using campaign budget optimization you should avoid putting disparate audience types such as lookalikes, retargeting and interest-based segments into a single campaign. When this happens, budgets will very quickly skew toward what Facebook’s bidding algorithm assumes will be the highest performing audience. This essentially defeats the purpose of using campaign budget optimization because a single audience type will more often outperform the others. As the optimization engine looks to test the other audiences, it doesn’t see better performance and stays “locked in” to your top performer because it is still most likely to drive the lowest CPA. Instead, when building campaigns with CBO enabled, make sure your audiences are similar and group multiple custom audiences of the same type such as engagement, CRM-based audiences, and retargeting in the same campaign. With the likelihood that these audiences will perform similarly high, you can be confident that Facebook’s bidding engine will perform the way it was intended to, allocating budgets appropriately. During testing, I found that my optimal campaign was around 6 ad sets, each with “somewhat similar” audience sizes of approximately under 500k, 500k to 1 million or 1M+, respectively. The reason for using a similar audience size across your ad sets? Smaller audiences will more quickly exhaust their lower cost conversions, moving on to the larger audiences within just a few days or a week. Grouping similar audience sizes will result in smoother delivery and less campaign “turbulence” when increasing budgets or running a campaign over longer periods of time. Using campaign budget optimization as a testing ground for new audiences can be a great strategy. One of the best ways to accomplish this is by testing each audience segment individually in its own ad set, also known as “single audience ad sets,” or SAAS. Similar to the paid search strategy of using single keyword ad groups, both the SAAS and SKAG campaign structures allow you to isolate the targeting variable that is responsible for your conversions and build your ideal targeting, personalized ad content, and landing page combination to drive results. Step 1 - Use campaign budget optimization to test new audiences of any type (interest, lookalike, custom) and see which perform well. Step 2 - Once you find a high-performing audience segment, pause it in the CBO campaign and then place it into its own standard campaign with a unique ad set. This allows you to identify audiences that will perform well in their own campaign, in which you can then test different aspects of your funnel (ads, landing pages, bid strategies) more effectively than as part of a CBO-enabled campaign. Many Facebook Ads practitioners leverage lookalike audiences to scale their campaigns and overall conversion volume. I found that lookalike audiences perform exceptionally well when grouped with other percentage-based audiences of the same seed audience in a CBO-enabled campaign. By creating numerous lookalikes from the same audience segment at different percentages (1%, 1-2%, 2-3%, etc.) and excluding them from each other to avoid audience overlap, you can easily create a lookalike campaign with an audience size of 10 million. In numerous tests, this type of campaign structure started to grow quickly in conversion volume after the learning period was completed as the algorithm had the flexibility to move between much larger groups of people with ease. Most best practices for Facebook Ads still apply when using CBO, but marketers should pay careful attention to the way in which CBO works in relation to other ad sets in the campaign. With Facebook now reallocating your budget to maximize ROI, you can focus on other improvements that can drive your performance even higher. Tagging both standard and custom events is a must for every Facebook Ads account. For CBO-enabled campaigns, this is even more critical. I found that CBO worked well when using a single standard conversion event such as lead or registration, but it was even more effective when other soft conversions events such as button clicks or page scroll depth were tracked but not optimized to. If you are looking to take your campaign to the next level, give the pixel more data by including additional custom events. These will help improve decision-making for the overall optimization engine, which more accurately informs where Facebook will reallocate your budget to get you the best results. No matter what, Facebook needs time to understand your audience, your conversion goals, and the attributes of your pixel’s converting users to really tune its optimization engine. Facebook states that “your ad set needs about 50 conversions per week for our delivery system to learn who it's best to show your ads to” and this still applies to campaigns that are using campaign budget optimization. If your campaign has only 1 or 2 unique ad sets that are driving results, it can be hard for other audiences to start converting. In some cases, this may not be ideal — so if you value results more from some ad sets (read: audiences) over another, Facebook suggests that you control this “through appropriate bid caps or cost targets” instead of using ad set spend limits, which may affect the automatic bidding strategy. The image below from the Facebook UI shows exactly show to control this. There’s no doubt that the use of CBO is effective when used correctly. One easy way to get off track is by having a limited budget or too many ad sets. Campaign budgets should be large enough to equally distribute across your campaign ad sets with a daily budget that is capable of driving the minimum recommended conversions (50 or more) per week as discussed above. Placing too little daily budget on the campaign will leave your campaigns restricted and less likely to unlock the full potential of the budget optimization settings. With a new feature like campaign budget optimization active, your strategy is likely more focused on how to use it most effectively. I found one of the best ways to maintain performance across a CBO-enabled campaign was still to flight new ads regularly. AdStage excels at automated ad flighting, and using it with campaign budget optimization is a great way to make your campaigns continue to drive results. Using Facebook’s campaign budget optimization feature over the past few months has helped me to reevaluate my process for testing new audiences, budget for top performing segments, and scale overall conversion volume quickly and effectively. Not only did CBO perform better across dozens of campaigns, but I spent less time allocating budget to top-performing audiences, which allowed me to focus on ad copy, audiences and landing page content—all of which had a positive effect on campaign performance. What Facebook has done with this campaign budget optimization is truly impressive and it is apparent that the product team will continue to build core features for the benefit of its direct response advertisers. As with any new platform functionality, your campaigns will be subject to trial and error but hopefully, the learnings outlined above can help you take steps toward better ROI and improved campaign performance.